Last weekend was our annual Cape retreat with some of our friends. A few couples stayed with us at the house where we did what we do best: chat, read, eat, and drink. Before their arrival, I spent an afternoon preparing large quantities of corn salad, sangria, and lobster salad. This freed up my time, allowing me to enjoy the warm weather a bit more, instead of having to spend hours in the kitchen. The only meal I didn't plan for was breakfast. I'm an early riser, so after I'd gotten dressed and taken the dog out, I began preparing one of my favorite weekend breakfasts: scrambled eggs. 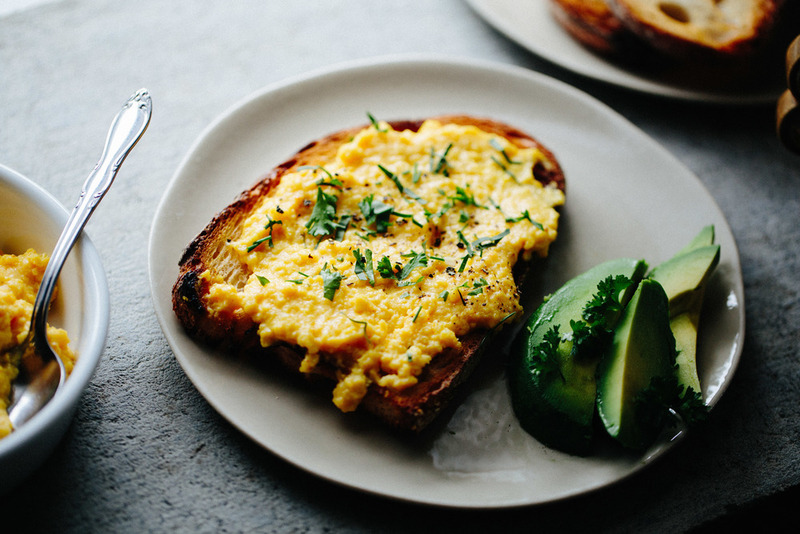 These scrambled eggs are, quite simply, the best I’ve ever had. It's a slightly adapted version of Julia Chid's recipe, which calls for a pat of butter at the end. But I think the real beauty comes from the low and slow method she used. Instead of getting clumps of egg, this preparation is more reminiscent of a custard. By the end, you have smooth, rich and creamy eggs that are perfect for spreading on top of toast. 1. Whisk the eggs and milk together in a bowl with salt and pepper for 20 to 30 seconds, until yolks and whites are blended and a foam starts to form on top. 2. Butter the pan with 1 tablespoon of softened butter. Pour in the eggs and set over moderately low heat. Stir slowly and continually, reaching all over the bottom of the pan. Nothing will seem to happen for 2 to 3 minutes as the eggs gradually heat. Suddenly they will begin to thicken into a custard. Stir rapidly, moving pan on and off heat, until the eggs have almost thickened to the consistency you wish. Then remove from heat, as they will continue to thicken slightly. 3. Just as soon as they are of the right consistency, stir in grated cheddar cheese into the eggs along with the the enrichment butter, which will stop the cooking. Season to taste, turn out onto the platter, decorate with herbs, and serve.